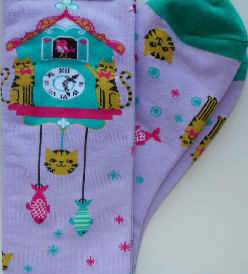 These light purple and teal knee high cat socks feature a striped orange cats on a cuckoo clock. These socks are 60% cotton, 38% polyester, 2% spandex, Fit women's sock size 9 - 11. Very soft. New.